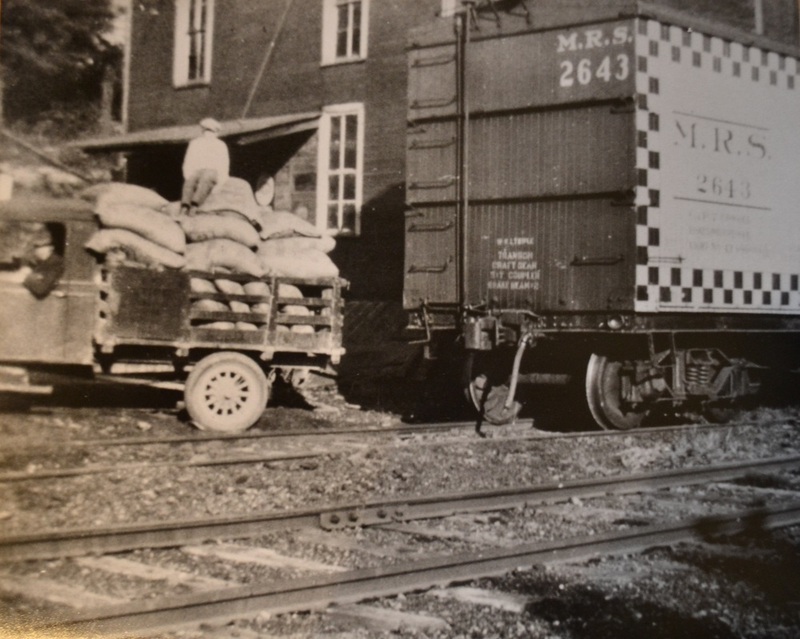 Did you know that Green once had two railroad depots? Beginning in 1880 the Valley Railway ran North to South near the East boundary of Green Township. The Uniontown Depot was located in Myersville and the Greentown Depot was located in Aultman. 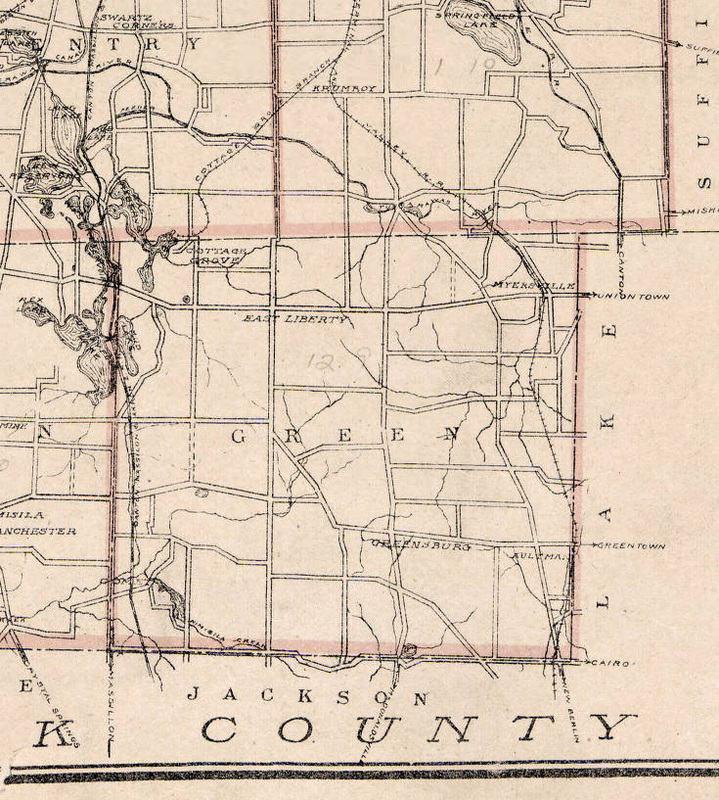 In the 1880's a branch of the Valley Railway was added through Coventry Township that ran to Cottage Grove Lake to service resort guests (see map below). Do you know about the Cottage Grove Resort? To learn more about the Cuyahoga Valley Scenic Railroad run by the National Park Service, click here. To learn about the fate of Greentown Station, click here. Identified as Greentown Station, located in Aultman in Green Township, circa 1967 prior to relocation, unidentified Green Historical Society members in Bev Coss Collection, Akron-Summit County Public Library. Aultman Depot circa 1910, see Canton Repository Article dated 1967 transcription. "We now leave the Plain on a curve to the right, and as we round this curve, the remains of an old saw mill can be seen to our right. As the engine whistles for Greentown we pass the Drain Tile Works of Isaac Stripe, back of which is the Sewer Pipe Works of H. & I. Stripe. On the right still further on, we pass the coal bank of Smith, Borst & Company. A side track runs off to it on the right. These firms are represented in this book in connection with the history of Greentown. The log hut on the side of the hill to the left before we arrive at the station is the birth place of Lewis Miller, Esq., now of the Buckeye Works at Akron. We now arrive at Greentown. The depot is on the left, and the village is three-fourths of a mile to the right, and Greensburg is two and a half miles to the left. About five hundred feet north of the depot we cross the great water-shed of the State, (see page 20). In the beautiful grove to the right, (see engraving) the water can be seen to divide, part going to the Ohio River and part to Lake Erie. The elevation here is about 555 feet above Lake Erie. We now pass over the Greentown Plain, which is two miles of straight track over the bottom lands and marshes. The streams that appear between here and Krumroy feed the Tuscarawaas River. Three and a half miles north of Greentown we arrive at Uniontown. As we come to the depot, we pass a saw mill on the left. Great numbers of ties for the road have been sawed here. The village is one mile to the right. The small settlement on the left of the depot is called Myersville, which has been settled since the railroad has been built. As we leave the depot we pass a grain warehouse on our left. Grain from the surrounding country is brought here and shipped over the Valley Road to the Akron mills. One mile north of Uniontown, we pass through the Millheim mill pond, the mill being situated some distance to the right and can be seen in the distance when we get a little further on." Take to Trolley to Comet - Almost?